Today, my local Asian market carried Vietnamese sweet bananas called chuối xiêm. Chuối xiêm are small, thin-peel bananas that are sweet and very flavorful when they are ripe. I made some coconut and sweet tapioca pudding with the bananas, called chè chuối xiêm in Vietnamese. Vietnamese desserts are not always the prettiest-looking sweets, but they are very good. 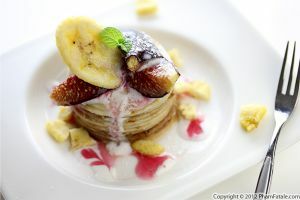 They are composed of ingredients different from Western desserts and might look unusual at first. 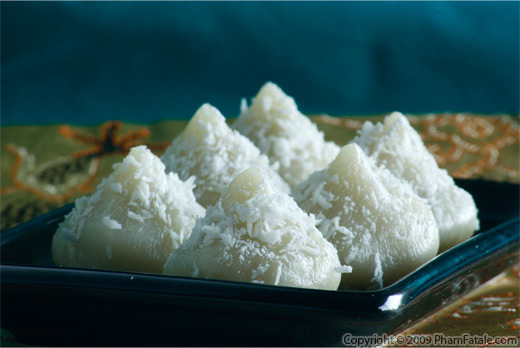 A lot of traditional Vietnamese desserts are made from sticky rice or other starches like cassava. Soak the tapioca pearls in water overnight or for at least an hour. The next day, drain the tapioca pearls. Set aside. Do the same for the tapioca shreds. Soak them in water for at least one hour, then drain. Place the bananas in a bowl. Sprinkle with brown sugar. Set aside. Bring the water to a boil. Add the tapioca pearls. Reduce the heat to medium-low and cook for about 20 minutes until the tapioca pearls are fluffed-up and translucent. Stir frequently. Drain the cooked tapioca pearls. The pearls should feel gummy but not too firm between your thumb and finger. Do not overcook, as the pearls will finish cooking in the coconut sauce. Set aside. Same cooking method for the tapioca shreds: Bring the water to a boil in a different saucepan. Add the tapioca shreds. Reduce the heat to medium-low and cook for about 20 minutes until the tapioca shreds are transparent. Stir frequently to prevent the pieces from sticking to the bottom. Drain the cooked tapioca shreds. Do not overcook, as the tapioca shreds will finish cooking in the coconut sauce. Set aside. In another saucepan, caramelize the sugar and when it becomes slightly golden, add water and bring to a boil until all the caramel sugar is dissolved. Add the coconut milk. Bring to a boil, then reduce the heat to a gentle simmer. Add the pandan leaves, coconut cream and sea salt. Mix well, then add the bananas. 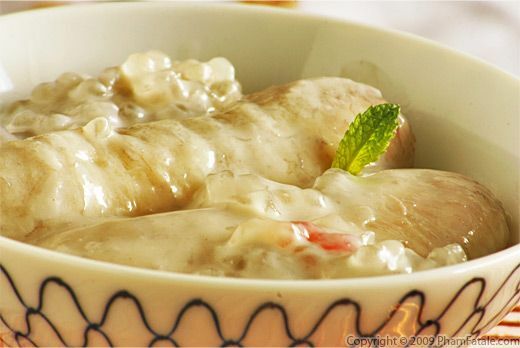 Cook for about 5-6 minutes until the bananas are nicely coated with the coconut sauce. Add the tapioca pearls and tapioca shreds and cook for another 2-3 minutes. Gently stir. Be very careful not to break the bananas. Cover the saucepan. Let the dessert sit for at about 20-30 minutes. Remove and discard the pandan leaves. Divide among 10 bowls. You can garnish with vanilla ice cream or a dollop of whipped cream and sprinkle some toasted sesame seeds or slightly crushed peanuts. Serve hot or at room temperature. 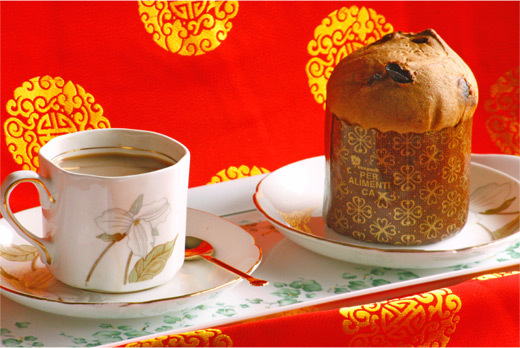 Serve with a nice cup of hot tea. Enjoy! You might find sago pearls at the Asian market. Tapioca pearls are similar to sago pearls, and are used in essentially the same ways. Consequently, tapioca may be called sago, and vice versa. Tapioca shreds are called bột khoai in Vietnamese. You can find them in Asian stores. There are 3 different colors in the package: transparent, red and green. THey're commonly used in the traditional Vietnamese rainbow drink, chè ba màu, literally 3-colored drink. The rainbow drink contains 3-colored tapioca shreds, split mung beans and a lot of coconut milk. Pick firm but ripe chuối xiêm bananas. If you can't find this particular variety at your market, you can substitute baby bananas or regular ripe bananas. I slightly bruise the pandan leaves before placing them in the coconut milk to ensure that all the flavors are released. I use AROY-D brand coconut milk, sold in a can . It is sold in a can. It has no preservatives and is very convenient; they sell it in little packages. I also use AROY-D brand coconut cream. I usually use the leftover to make chicken and tofu satay. Coconut cream is sold in different sized packages. You can find both coconut milk and cream in any Asian store. 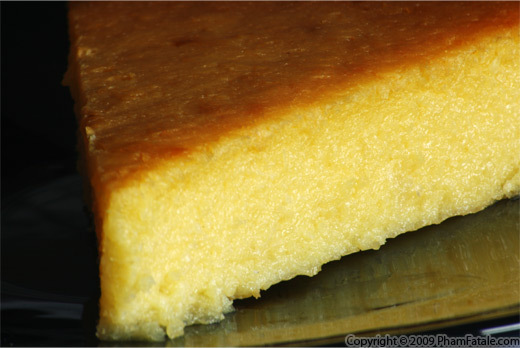 If you're interested in making another Vietnamese dessert, check out my rau câu recipe. Did you know? Use sago/tapioca starch as a textile stiffener. I often use it for my Indian-style embroidered shirts and Vietnamese outfits. It works great and keep my shirts looking brand new. Published By: Jacqueline Pham on June 25, 2009. 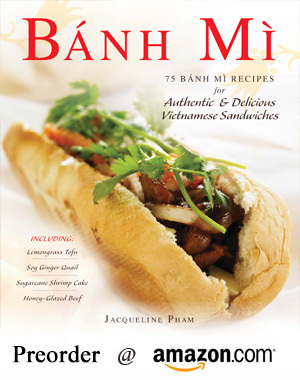 I've never had any Vietnamese food I didn't like, and I know my daughter will love this. they should have it at big grocery stores, but if not you can just use chili powder. This looks so delicious. I love all the flavors here. Would finger bananas substitute, do you think? I'm not sure we'd get chuối xiêm in the markets here in the Midwest. Thanks for visiting my blog! This recipe looks very yummy. I love getting the sticky rice dessert at sushi restaurants. I wish it is morning instead of 11:45 PM where I am at...I am running to our nearby Asian market to pick up all the ingredients for this dessert! Can't wait! Where would I find the Vietnamese bananas? I love sago pearl with coconut milk...your has banana in it...yummie! Love the pictures! My dear friend Mc LOVE tapioca pudding and I hadn't found a recipe that "convinced" me. But this looks outstanding, I'll surprise her with it! Thanks! 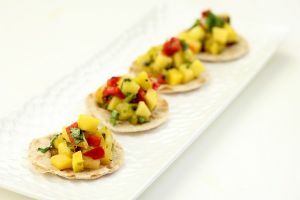 Just found your site for the fist time on Tastespotting and loving the recipes. They make a version of this at one of our favorite restaurants in NYC, Yakitori Torys. Looking forward to trying this.